We had a very successful hike today scouting for native orchids. We saw three kinds of wild orchids. 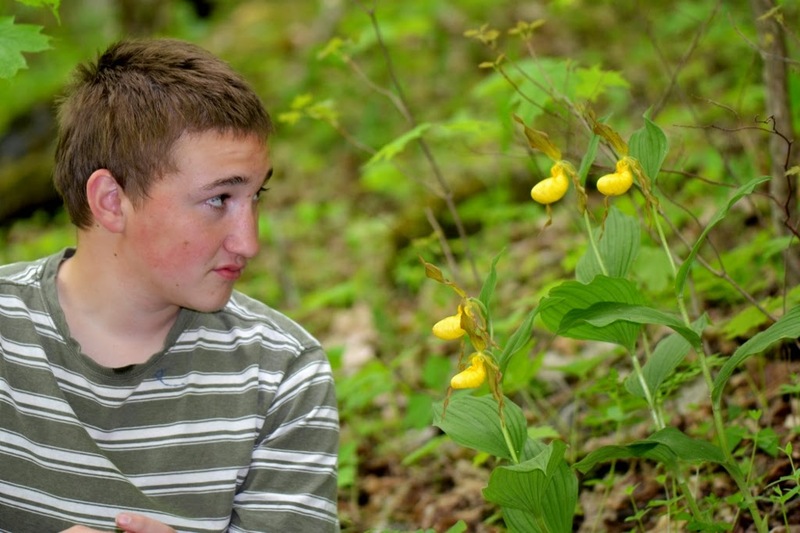 This photo shows my son beside a cluster of Yellow Lady's Slippers. We were hiking through a rich woods on a limestone hillside. These knee-high orchids were scattered everywhere... one here, a few there, a couple more of the yellow orchids right up there! I'll post more photos of the Yellow Lady's Slippers (Cypripedium parviflorum) soon... and of course I'll examine their pollination mechanism. Here is another wild orchid we saw today. 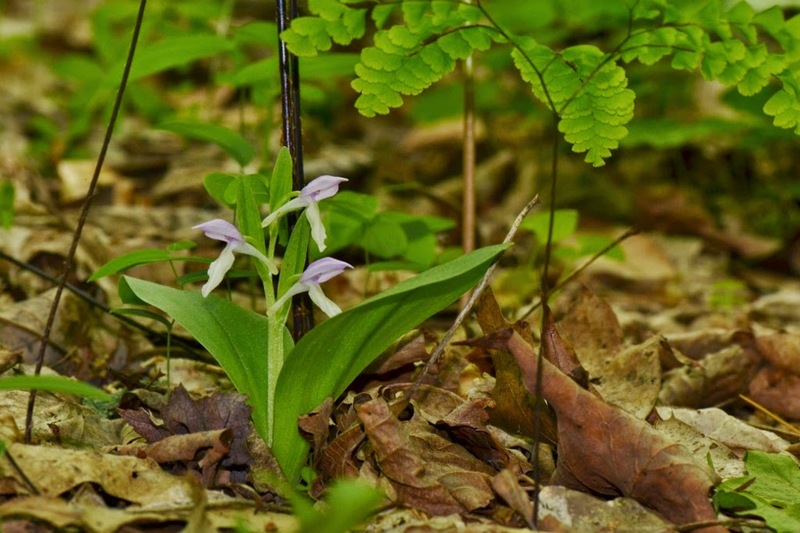 This lovely little orchid is a Showy Orchis (Galearis spectabilis) that was growing under a Maidenhair Fern. We found plenty of these small orchids growing along a stream... well, high on its banks and on its floodplain. I'll post about the lavender and white Showy Orchis in the near future. No, I won't forget to investigate its pollination mechanism. 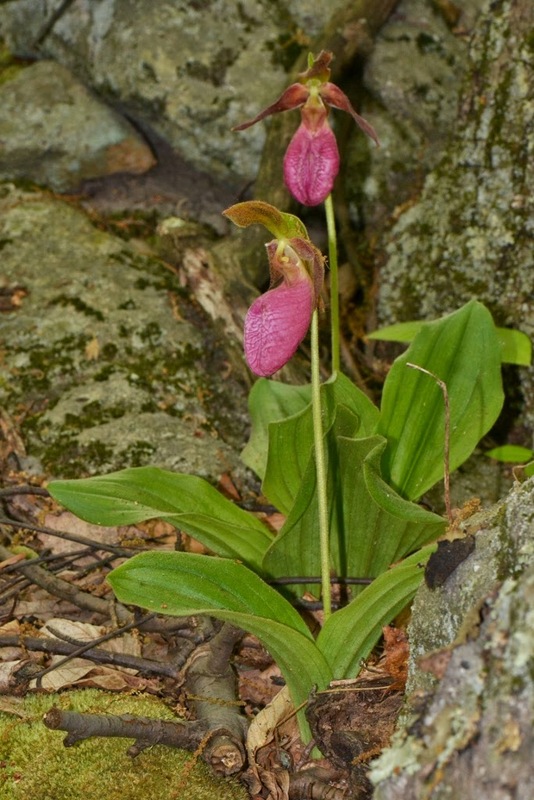 On the rocky ridge top among the large boulders we saw a number of Pink Lady's Slippers. Remember my post about the Pink Lady's Slipper and its pollination mechanism ? 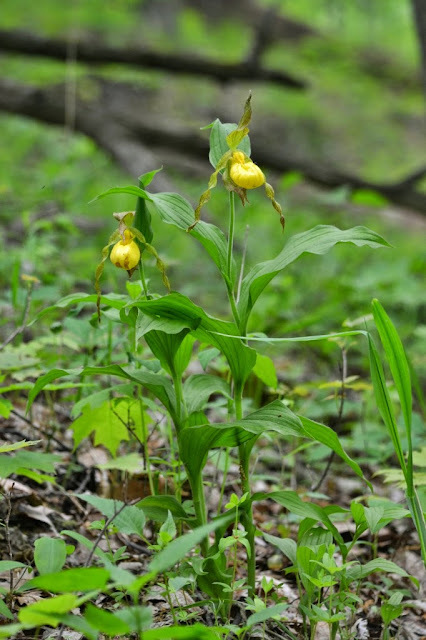 A short hike filled with a variety of bountiful wild orchids.... that's what I call FUN! We have the pink ones here. Can't recall if I've seen the yellow ones.